Liliana Isabelle L'Heureux: Liliana Isabelle L'Heureux, daughter of Thomas and Jessica L'Heureux of 111 N. Walnut Street Minonk, was born on September 21, 2004 at OSF-St. Joseph's in Bloomington, Illinois. She was 8 lbs, 2 oz at birth. She is welcomed by her parents, her big brother Henry Robert (2 1/2), her live-in grandma, Ann Marie Hawthorne and a large extended family from California to Chicago. Keaton Thomas Cunningham: Jeremy and Julie Cunningham, Bloomington, are the proud parents of a son, Keaton Thomas Cunningham, born at 6:19 a.m. Sept. 20, 2004, at St. Joseph Medical Center, Bloomington. He is the brother of Gavin, 2 1/2. Maternal grandparents are Mike and Lori Fuoss of Tremont. Paternal grandparents are Martha Owens, Indian Wells, CA and the late James Cunningham of Minonk. 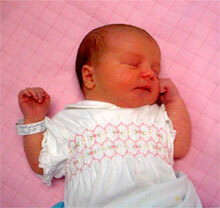 Olivia Lee Orabutt: Ryan and Lacy Orabutt of Minonk are pleased to announce the birth of their first daughter. 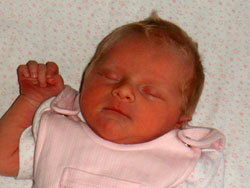 Olivia Lee was born August 30, 2004, at 3:44 p.m. at BroMenn Regional Medical Center, Normal. 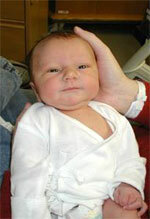 She weighed 6 pounds 7 ounces and measured 18 ¼ inches in length at birth. Grandparents are Larry and Karen Schmitt of Tonica; Randy and Gayla Tate of DeWitt; Martha Orabutt of Dana and Jim Orabutt of Itasca. Great-grandparents are Esther Gauger of Minonk; Delbert and Evelyn Tate of Jonesboro, AK; Marie Schmitt of Ottawa and Lorin and Jane Hallenbeck of Downers Grove. Elianna Grace Ludwig - Elianna Grace Ludwig was born to Troy and Leslie of Minonk on July 8, 2004, at Bromenn Medical Center, Normal. She weighed 6lbs 11oz and measured 19 inches in length. She was welcomed home by her three sisters Keganne-7yrs., Alexandrea-4yrs., and Jacilyn-2 1/2yrs. Grandparents are Don and Helen Ludwig of rural Minonk and Kevin and Linda Lindley of Minonk. Great Grandparents are Eva Ludwig of rural Minonk, Kenneth and Sharon Lindley of Minonk, Floyd and Joyce Garrett of Bloomington, and Garrit and Nola Heijnen of Wadsworth, OH. Great-Great-Grandmother, Fern Stiger, is currently a resident at Leroy Manor in LeRoy. Bradley Allan Aber - Maryanne Stokowski has had a few Great Great Grandkids, but the newest addition is Bradley Allan Aber born in Colorado Springs Colorado. He weighed 5lbs 6 oz. Great grandparents are Karen and Jerry Mooradian of Rutland. Grandparents are Debra and Bill Baumgartner of Colorado Springs, Colorado. Debra use to live in Minonk and play with Ruth Hakes, Carrie Ranken, Art Hillenburg and to many more to say. She went to Minonk Elementary School. Congraulations to everyone. Spencer James Dreyer - Born January 6th, Stanford University Hospital, Palo Alto, CA, to Sarah Jane (Uphoff) and Robert Dreyer. Maternal grandparents are Dr. and Mrs. Dean Uphoff of West Hartford, Conn.